Today started with a trip to see my dermatologist. I just love her. She always has a smile for me and looks me directly in the eyes, her gaze never moving from mine: “How’s it going today, Julie?” She seriously wants to know. She knows that my alopecia causes me alarm when those spots of baldness start as small dime-sized circles on my scalp and then converge into dollar-sized circles; not the current quarter-sized dollar coins, but the old much larger silver dollar size. It’s been happening again. The hair falls out and leaves those patches. I ask Steve to check them for me and he does. He tells me there are lots of new hairs coming in! But all I see is scalp. So I went to see Dr. Finnegan today. Before we get to the shots, she asks me about my stress. Do I have any? I never really know how to answer this because I don’t think I feel stress. Every-day life is what I call it. There is caring for Jana and meeting her needs. (She had a seizure on Sunday morning and fell. I am sure another is coming because they seem to come in pairs. Please say a prayer for her continued safety.) But she and I have walked this journey for 31 years together. There is our ongoing search at church for a new senior pastor –and boss – for me. I really have stopped worrying about that. It will happen in God’s timing and I am really enjoying Rich, our interim. He and I have arrived at a place of friendship and love. Fourteen months ago I was stressed about this, but not now. My sisters are stressed about my upcoming travel back to Lebanon and Syria. I wish I could relieve them of that, but I can’t. I did have a wonderful conversation with Rich today about the trip and what is going on there currently. He said he would hate to see me on the news… You had to be there. It was warm, funny and heartfelt. I am feeling stress about the pace of the addition to the house for Jana. There is nothing I can do about it, however. I don’t know how to erect framing or put up drywall, install windows, run cables, or anything else that would help. I am the accounting side, not the construction side. So I try to be patient and cheer at every advance we make. We’ve got a foundation! We’ve got framed walls and roof (mostly)! Let’s see what happened today! So I got my injections and left knowing that the hair will grow back. It always has, in its time. And it will probably fall out again. Wash. Rinse. Repeat. But what came to my mind was what Marilyn tells us when we travel and what Barbara always emphasizes on those trips: The safest place to be is in the will of God. And I have really come to believe that. All my life I’ve been striving to do the right thing, say the right words in prayer, keep the right attitude, as if that was what my father wanted. All he wants is my obedience: love him with all my heart, my soul, my mind and my strength, and that I love my neighbor as myself. It’s taken me so long to learn that lesson. And out of that flows just one big “thank you” for the stress, the burden, the weight that is lifted from my back in the process. I sing out in worship on Sundays because I belong to that one and I am so grateful to be called child of God. And that is the only place I find security. And then I offer a prayer, “Thy will be done,” and hope that I am in the flow of that will that is not my own. My hope is built on nothing less than Jesus’ blood and righteousness, goes the old hymn. And that is where my hope is. That is where my faith is. And that is where my love comes from. And because of that my stress is relieved, indeed, it is lifted from me. And it is the only place where I find security. Not in guns, not in armies, not in my bank account, not in the riches of this world or the promises of people. 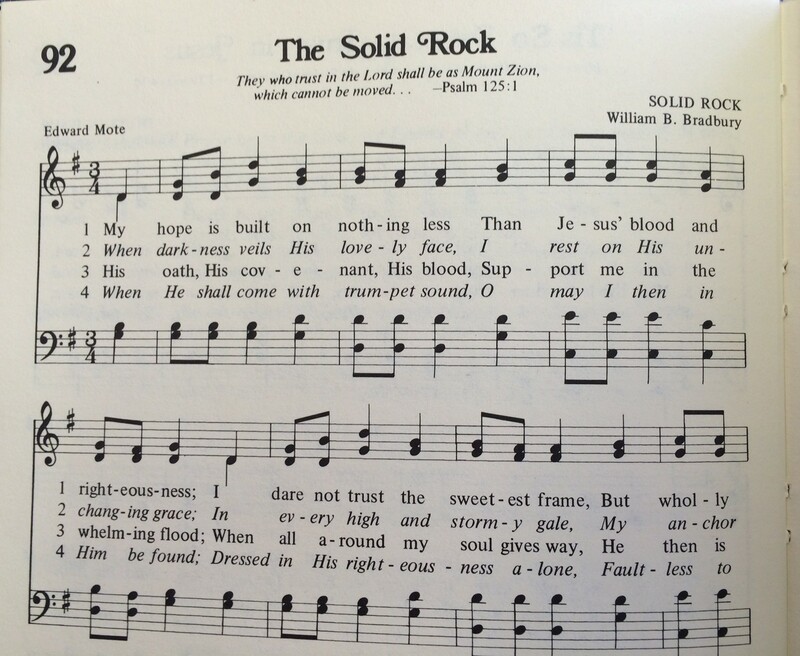 “I dare not trust the sweetest frame, but wholly lean on Jesus’ name.” That is a solid rock! And so my security is walking with my Lord in his way, not mine.